I wanted to ask if you could suggest any places for an engagement party? My parents have expressed interest in throwing one, but they are out of town and are asking for suggestions. Our guest list will be around 70 ppl, and I don't want them to spend a lot of money. Joe and I are [more] casual than formal, so maybe something like a BBQ at a park. Though the few places I've called charge a significant fee just for reserving a pavilion. Have you heard of any unique engagement parties, or know of any hidden gems in the area that we could contact? Because Lisa and her fiance are looking for something casual, that probably widens the range of places. And there a bunch of parks around the region. So there have gotta be some good places. Got a suggestion for Lisa? Please share! And bonus points for a sentence or two about why you're suggesting that place. You can reserve a lakeside area with a fireplace and building at Little Notch for the party - and even have the option of renting platform tents if some folks to stay over. Very reasonable prices. Fort Ann, NY. campdirector@camplittlenotch.org for details. It is an ex-GS camp which was purchased and is being run by a non-profit. It is beautiful, pristine, surrounds an 8-acre lake, and the property includes an easy hike to a Civil War era iron furnace. We have been to informal BBQ parties at Grafton Lake State Park for the past few years. I believe if you just want to grab one (or a few picnic tables), they are free. If the pavilion is free, I think you can grab it as well. If you want to make sure and book the pavilion, there might be a fee. Peebles Island State Park, nestled between Cohoes and Waterford, has a very nice pavilion with great views of the Hudson. And The Angry Penguin Tavern & Restaurant, right across the bridge in Waterford, does very good buffet catering at quite reasonable prices - maybe a bit cheaper if you pick up the dishes and serve them yourselves.. We had an excellent and very generous buffet party from there for less than $15/ person. Try Thacher Park. You can reserve a pavilion for $150-$250, and the view will be incredible. The Crossings in Colonie on Albany Shaker Rd. 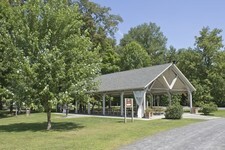 The Schodack Town Park is very nice and has a large pavilion that would easly accomodate a party your size. correction: Camp Little Notch has a private 80 (eighty) acre lake! Perfect for kayaking, paddling, swimming and sailing. There are pavillions up at the Colonie town park on the Mohawk, up Route 9. It's pretty there and pretty quiet because most people seem to go to the Crossings these days. The only downside is that they might charge all your guests to come into the park. Which is probably why most people go to the Crossings.